Membrane keyboards are by far the most commonly used with computers. They are designed so that all the keycaps are positioned above rubber domes, which in turn are above a 3-layer plastic membrane that spreads over the entire keyboard. When the user presses the keycap the full key travel distance, a contact point at the top of the rubber dome pushes the top layer through a hole in the middle layer to contact the bottom layer, creating a short circuit which generates the keystroke that is then sent to the computer. The middle layer of the membrane keeps the top and bottom layers from contacting each other except when a switch is depressed completely. Differences in the shape and thickness of the rubber domes determine the travel, resistance, and tactile feedback of the switch, however the keystrokes are only generated when the key is fully depressed. The travel distance is usually 'full-travel' i.e. 3.5 - 4.0 mm, and the elasticity of the rubber dome membrane returns the key to its default 'up' position. 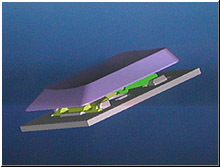 Membrane keyboards are typically inexpensive and can range from firm to soft feel depending on the design of the rubber dome, however most have a 'softer' feel due to the 'sponginess' of the dome. They are the least durable of keyboards, with ratings typically in the 1 to 10 million keystroke range. Over time some keys become inelastic and other overly elastic, creating a variance in how much force is required to type throughout the keyboard. This can be caused by various factors, including buildup of debris, rubber fatigue, manufacturing imperfections and even ultraviolet radiation. As such while a membrane keyboard may be rated at 10 million keystrokes, the force and performance of the keys can be affected in as little as a few months of use. Another special case of rubber dome switch is conductive rubber. While this mechanical portion of the switch can be identical to a membrane keyboard (either simple rubber dome or scissors switch), the electrical portion only uses a single layer. The "pill" portion of the rubber dome is a specially-doped rubber which conducts electricity, so that when the switch bottoms out, the pill directly shorts out two different circuits to cause a switch action. Conductive rubber computer keyboards are rare, in part because they are somwhat more expensive to manufacture than membrane keyboards. However, one advantage of conductive rubber keyboards is they can easily be repaired in the field by cleaning or replacing the rubber and the conductive layer. In contrast, a membrane keyboard must be manufactured and assembled in a clean-room environment, so that it is not generally effective to try to clean or repair such a keyboard. Some membrane keyboards have no dome at all (like on a microwave) and have no significant movement (i.e. key travel) whatsoever - these are occasionally found on some specialty computer keyboards. A special case of computer keyboard membrane switch is the scissors switch. It still uses rubber domes, but a special plastic 'scissors'mechanism links the keycap to a plunger that depresses the rubber dome with a much shorter travel than the typical rubber dome keyboard. Typically scissors switch keyboards also employ 3-layer membranes as the electrical component of the switch. These stabilizing scissor-like devices (like the one pictured at right) to extend the lifespan of the membrane to as much as 10 million keystrokes. They also usually have a shorter key travel distance (2 mm instead of 3.5 - 4 mm for membrane keyswitches), and feel more solid (i.e. less side to side movement during key travel) than regular membrane keyswitches. This type of keyswitch is usually found on the built-in keyboards on laptops. Scissor-switch membrane keyboards are typically slightly more expensive and have a 'bouncier' feel to them, as the keys have scissor mechanisms to help them 'spring back' after you depress the keyswitch. They are harder to clean (due to the limited movement of the keys) but also less likely to get debris in them as the gaps between the keys are often less (as there is no need for extra room to allow for the 'wiggle' in the key as you would find on a membrane keyboard. Mechanical keyswitches are more intricate and of higher quality than either of the types of membrane keyboards. Each key has its own independent keyswitch mechanism that will register when a key is pressed. For example on the mechanical keyswitch at right the keycap rests on top of the blue plunger mechanism which depresses into the unit. In most cases the key is actuated (that is the keystroke is generated and sent to the computer) halfway through the key travel distance. For example, the key may be capable of travelling 4 mm before hitting the bottom of the keywell, but the keystroke is generated after 2 mm. This means that as a touch typist, you need not press keys fully down, reducing the constant jarring action on your fingertips and unnecessary muscle action. In addition, keys often offer increasing resistance after the keystroke is generated, encouraging you to release and move on to the next keystroke. Finally, keys snap back to ready position quicker, allowing for faster typing speeds. All these features means there is both audible (clicks) and tactile (feel) feedback when you have successfully actuated a keystroke, and whether you are an experienced touch typist or learning to touch type, this will improve your speed, accuracy and eliminate the wasted time spent looking at the screen to ensure that you have typed accurately. About the only person that doesn't benefit from a mechanical keyboard is a hunt and peck typist (a person who hovers their fingers several inches above the keyboard and uses typically only the index finger on each hand to type). IMPORTANT NOTE: Many people who are used to Membrane Keyboards will press the keys down too far on a Mechanical Keyswitch, 'bottoming out' on every keystroke, resulting in a loud clack in addition to the light click of the keyswitch which is generated half-way through the key travel distance. Once a user learns to not press the keys completely down with every keystroke, the level of noise generated when typing on a mechanical keyswitch keyboard is substantially reduced. There are different types of mechanical keyswitches as well. Linear Keyswitches are ones where there is no indication of when you have actuated the key (i.e. generated the keystroke) and have constant force through the entire key travel distance. An example of a linear keyswitch are the BLACK stemmed units available from Cherry. Light Tactile Keyswitches are mechanical keyswitches which have a low level of tactility and provide a small amount of click feedback (both audible and force) when the keystroke is generated - this tactility is often so slight that people will mistake the keyswitch for a linear keyswitch. These light tactile keyswitches are ideal as they provide tactile feedback without generating a sensation that you are 'breaking through' when generating a keystroke. An example of a light tactile keyswitch is the BROWN stemmed switches available from Cherry. Tactile Keyswitches are mechanical keyswitches which have a normal level of tactility and provide a normal amount of click feedback (both audible and force) when the keystroke is generated - this tactility is apparent to any user but is no harder to press - although it can generate that sensation. These tactile keyswitches are very popular and a good alternative to the light tactile keyswitch as they provide conscious tactile feedback and are still low in force. An example of a tactile keyswitch is the BLUE stemmed switches available from Cherry (and pictured above). High Audible Tactile Keyswitches are feature a much louder 'click' sound, but do not typically require any more force to actuate. An example of a high audible tactile keyswitch is the Strongman Switch. High Force / Audible Keyswitches - these are for the most part no longer available today, but were popular in the early days of computing. IBM Model 'M' keyboards, which often weighed as much as 5 lbs featured these type of keyswitches (a buckling spring design), and while many users insist these were desirable, all the tactile benefits are present in the more modern 'Tactile' keyswitches without the accompanying muscle fatigue that was often associated with these older style keyboards (similar in feel to the old IBM Selectric typewriter). Mechanical keyboards are the most expensive of options and as they are mechanical, have the highest degree of tactility and responsiveness. The keys spring back consistently and quickly after being depressed, and do not lose performance with age. These keyboards are usually the most resistant to debris and spills as the mechanism is either protected, sealed or can be cleaned. They are typically rated anywhere from 20 to 50 million keystrokes. What makes a keyboard 'light' or 'soft' touch? The actual rating on the force used to actuate a key (i.e. generate a keystroke) is not the only factor in determining the amount of force actually used by a user. The reality is that most people will press keys harder than they need to unless they are given an indication that the key has fired i.e. a tactile sensation where you feel the 'rollover' effect when the keystroke is actuated. With most membrane keyboards, there is no tactility as the key must be pressed all the way down, and few people can control accurately the amount of force and distance needed when the only indication of this is when you 'bottom out' at the end of your keystroke. This is an even greater problem with the scissor-switch membrane as the key travel distance is reduced, although because of the reduced distance there is a perception of less force (when in actuality it is less force x time). With all mechanical keyswitches (except for linear keyswitches) there is a tactile indicator when the key fires and a 'stopping distance' after this point, which provides a clear sensation of the amount of force required to cause the key to fire and also a 'deceleration ramp' of sorts for your finger as you are typing, preventing you from the jarring impact of reaching the end of the key travel distance. All materials copyright © 2012 Micwil Group of Companies Ltd.